It’s the ‘Month of the Transits’ on Astropost and this time it is about transit Uranus. Uranus is the 'different' planet. The axis of rotation is tilted sideways. It is not the first time that a transit of Uranus was mentioned here. Astropost focuses on the news and Uranus happens to be the symbol of news (all that is new, surprising and shocking; food for newspapers). Transits of Uranus are a sort of a guarantee for VIP’s to see their photo in the papers. Uranus stimulates the hypes and the (together with Neptune) the ‘hoax’. 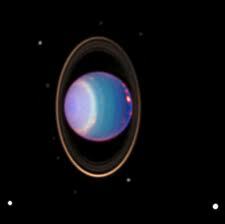 Transit of Uranus come by surprise. They accompany surgery, accidents (with Mars), sudden shocking changes (for example in your opinion, with Mercury, or habits, with the Moon or preferences with Venus). What happens depends on the setting, the natal chart and other conditions. With transit Uranus conjunct Jupiter I had a. positive news about my health, b. I moved to a better place, 3. I suddenly got out of a nasty situation. Surprise, upheavel, shocks, amazement and tension seem to be illustrated by the transit of Uranus. The nature of the aspect, existing similar aspects in the natal chart and the situation in general tell us what to expect. But with Uranus: prepare to expect the unexpected and unpredictable. With Uranus on the Asendant the situation is changing. I remember that I started to frequent the internet during this transit. With Uranus conjunct Mars there is a risk of fighting or an arrest and of accidents of any kind. This transit will disturb your energy, drives and actions or …aggression. With Uranus in aspect with Venus you might suddenly fall in love or find a new gadget (...!). Scandalls and sensational events, but also a fresh new approach are among the examples in the list. Posted in 2009: Uranus in aspect with Midheaven or square Ascendant can be tumultuous or even embarrassing. “The progressed conjunction of Uranus and Midheaven in today’s chart of Prince Harry of England. He makes controversial and shocking remarks and has to do a training. The life changing accident of Frida Kahlo was accompanied by a couple of transits and progressions. One of them was transit Uranus inconjunct Ascendant. I had an accident with transit Uranus semi square Mercury, resonating the Mercury-Uranus opposition in the natal chart. Very typical it was a matter of communications. When Alberto was born transit Uranus was opposition the midpoint Sun/Moon of Juan Carlos. The famous revolutions didn’t have Uranus in Aries…. Transit Uranus trine Sun and sesquisquare Midheaven during the final show of Larry King. An innocent convict was released later with transit Uranus exactly trine progressed Jupiter. Just before his trial he had transit Uranus opposition Ascendant and sextile Jupiter (the easy way out of interrogations, pleading guilty). By the way, the sextile doesn’t seem to be as ‘good’ as the trine is…See the label ‘sextile’ to see more examples of the sextile as the ‘too’ easy way out.